The lingering smell of turkey legs and the distant sound of “cheers” and “huzzahs” signaled the return of the 14th annual Sarasota Medieval Fair. Hundreds of visitors, including several students, filed into the dusty parking lots of the Sarasota Fairgrounds throughout the month of November to time travel back to what some see as a simpler time. This year’s theme centered around the story and ancient British Legend of King Arthur who as a boy studied under a mysterious magician to prepare for a future “in which he would ally himself with the greatest knights, love a legendary queen and unite a country dedicated to chivalrous values,” according to the festival’s brochure. 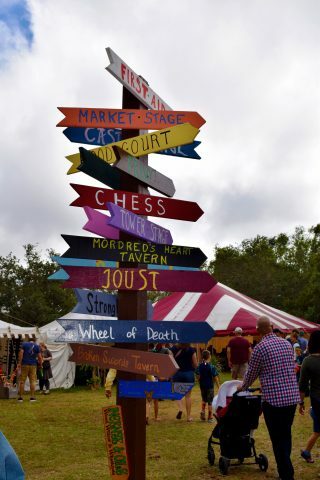 Picket signs pointed towards all the fan favorites: jousting, human chess and the taverns (they had delicious elderberry mead). A variety of fan-favorite shows and events returned to the fair for the three weekends of November, including the full-contact and full-armored jousting performance, human combat chess and the acrobatic group Acrobellum. The festival also recruited a handful of new events, like the wheel of death, an aerial contortion group Cirga Brava and an interactive comedian called the Renaissance Man. The fair offers a discounted admission fee to students so there is a history of students attending the Sarasota Medieval Fair. Thesis student Kira Thoenes attended the fair in past years and definitely recommends volunteering there for anyone interested. Another student heard about the fair through a friend who used to volunteer there. Founded in 2005, the Sarasota Medieval Fair continues to bring the community together for an interactive and historical journey. Information for this article was obtained from sarasotamedievalfair.com.